Any etiquette should be done as gesture of respect and should never be just an empty ceremony. Always remember that each of us is important to one another. Work hard. You are investing in yourself. Make your effort count. Help the dojo grow whenever possible! The growth of our membership relies heavily on referrals by students. 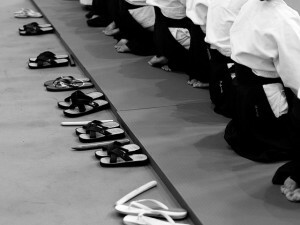 Any time you can, please encourage a colleague to visit the dojo or invite them to come try a free trial class with us. Any student is welcome to distribute written invitations (available in the dojo office) at any time to help build up our membership. If your school or company has a bulletin board, please post the dojo brochure there. When appropriate, encourage colleagues to visit and observe a class. If you know of any trade show like events that you think might be useful to advertise our dojo, let me know. I am happy to prepare an information booth or run an information table at any health fairs, trade shows, or other events sponsored by your company or a group you are affiliated with. Help keep the dojo clean and running well so that it will provide you with a comfortable, pleasant, and safe learning environment. Pay your dues on time. Pitch in with cleaning tasks. If you have an idea for improving conditions, please share it. Volunteer when possible to help with any of the maintenance or building improvement projects that are almost always underway. With your cooperation, the dojo can improve continuously. Your help is essential. No one person can shoulder the full responsibility to create a community. Everyone should pitch in to make it all that it can be. For more information see the FAQs Of New Students.